A vessel rescuing migrants in the Mediterranean Sea has issued a mayday distress call due to overcrowding on the boat, as rescuers struggle to handle this weekend’s unprecedented flow of people in such a short space of time. Jugend Rettet has called for “urgent help” to come to the aid of “rubberboats.” The vessel has been involved in the rescue of around 5,000 migrants helped off the Libyan coast in the past 72 hours. “We are completely unable to maneuver because there are so many people on board,” said Pauline Schmidt, a spokesperson for the Jugend Rettet group, an “organization of young adults who collect money for sea rescue on the Mediterranean,” according to its official Twitter. MAYDAY RELAY We need urgend help from #MRCC Rom! To many rubberboats the same time! The group’s rescue ship Iuventa and another vessel, Phoenix, have combined to form a floating rescue center which is currently housing over a thousand people, according to the group’s Facebook updates. “We have never had to deal with so many people at the same time,” Jugend Rettet Iuventa spokeswoman Pauline Schmidt told AFP. To make matters worse, the crew was forced to send one of its smaller rescue vessels to a nearby sinking migrant boat, worsening an already critical situation. According to the group, an MRCC patrol boat is en route to provide relief, but is still several hours away. “The lives of several hundred people are at stake right now. For them there is no more space below the deck of the Iuventa and the catching bad weather puts them in direct danger!” the group wrote on Facebook. Non-profit organizations such as Offshore Aid Station (MOAS), Sea Eye, and SOS Mediterranee, as well as Jugend Rettet Iuventa, in conjunction with the Italian Coast Guard, rescued at least 3,000 migrants off the Libyan coast on Saturday, on top of the 2,000 rescued Friday. 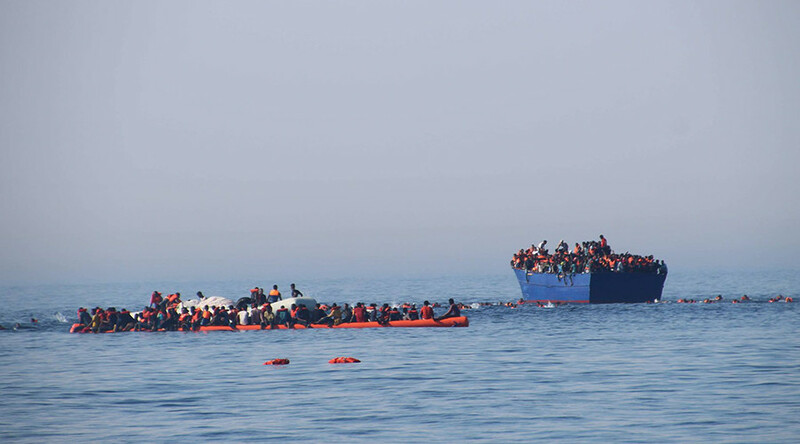 “If no help comes, we will lose people,” said the captain of the Iuventa, Kai Kaltegärtner. According to the IOM, over 664 people have drowned attempting to cross the Mediterranean so far in 2017, as international authorities struggle to cope with the surge in migration following the pause during the winter months. The deteriorating security situation in Libya, in combination with opportunism by local gangs and militant groups profiting from human trafficking, has led many desperate migrants to take to the seas in ramshackle dinghies and wooden boats unfit to carry so many people. They often do not have a sufficient number of flotation aids for all of the passengers on board.